Nature's Ballet, our Russian Orlov stallion, competed successfully for a dozen years, and sired offspring who are proving his value as a sire of performance horses. In a limited career, "Blue" amassed a rather phenomenal record. He completed the "Tevis Cup" 100 Mile Endurance Race five times out of five attempts, which was a world record for a stallion at the time. The Orlovs were the horses of the aristocracy in Russia. Developed by Count Peter Orlovski in the mid 1700's by crossing 5 Arabian stallions on Danish Warmblood type mares, the Orlov was bred for beauty, elegant action, stamina, and speed. Standing 15.2 to 17 hands high, they were either ridden or driven. Nature's Ballet has an interesting history. In 1959, Nikita Khrushchev, the Premier of the USSR, presented Natourschik, the Grand Champion Orlov stallion of that year to Cyrus Eaton, an American industrialist. The gift was in appreciation of Eaton's having been instrumental in effecting the sale of American agricultural commodities to Russia during their time of great food shortages, at the height of the "cold war." American farmers were able to sell surplus grains which had been rotting in silos, and Russian peasants were saved from starvation. Eaton had also donated some of his own prize Shorthorn bulls to Russia for the enrichment of their agricultural program. The horse chosen to express the gratitude of the Russian state was Natourschik ("Nature Lover"), the 17 hand high sire of Nature's Ballet. Khrushchev also sent two other stallions to complete a "Troika", or hitch of three stallions, as well as some mares, a veterinarian, and the horses' trainer. When Natourschik died, in 1969 the Russian government sent a replacement stallion, that year's current champion, named Cupal. Unfortunately, that horse was never trained for riding or driving, and died without siring any offspring. A troika consists of three stallions hitched abreast, pulling a unique light carriage or sleigh, depending upon the time of year. Natourschik performed as the lead or center horse, which trots with head and neck flexed vertically directed towards the front. The two stallions on each side canter, with their necks excessively bent toward their respective outsides, held by unilateral side check reins. The original Troika sent over in 1959 was timed over 21 miles of snow in 55 minutes, a rate of nearly 23 miles per hour....testament to their speed and endurance. The stallions, Natourschik, Otlik and Konus, toured the country demonstrating their speed and grace. The brochure distributed at the exhibitions specifically notes that Orlovs make excellent dressage horses, "capable of being schooled to the highest degree of Haute Ecole, which shows the natural attitudes and gaits of the horses." After touring, the stallions returned to Eaton's estate in Ohio, and faded from public attention. In 1976, Chester (Sonny) Ferris, of Fer-Glen Farms, Alberta, Canada, acquired Natourschik's son, Nature's Ballet, and promptly entered him in the Great American Horse Race, a 3000 mile extravaganza celebrating our country's bicentennial. According to the Newsweek article captioning a photo of the Orlov stallion, "if the race were decided on beauty, surely the winner would be the Orlov!" Although the Orlov did not win that race (the winner was a mule, as a matter of fact), he was in 11th place out of 500 horses at the end of 2000 miles, at which point his owner pulled him from the competition for personal reasons. Dr. Kerry Ridgway, California's world renowned endurance riding veterinarian, met Blue when Dr. Ridgway served as head veterinarian on the Great American Horse Race. Dr. Ridgway rode the Orlov on the horse's first Tevis Race that year, and bred his own Arabian mare to the stallion. Dressage trainer Michael Norrel took Blue through Tevis the next year, to be followed in 1978 by another successful completion with co-owner Brenda Ferris. Since Tevis has on average a 50% completion ratio, the odds are that any given horse will be unsuccessful half of his attempts. Blue was 100% successful, five times, earning his world record. In 1979, he was off to three years in horse heaven on the Canadian plains with a herd of select mares. In the mean while, I purchased the offspring of Dr. Ridgway's mare and Nature's Ballet, a colt named Nature's Tzar. Tzar proved to be the horse of my dreams, combining the agility, endurance and flair of the Arabian with his sire's tremendous bone, length of stride, and exceptional disposition. The year I campaigned Tzar at first level in dressage, he earned 27 blue ribbons, with many scores of eight, and the occasional nine. At the California Dressage Society Championship Horse Show, the international judge Col. Andrew diSzigney stopped us as we were leaving the arena after performing a test, and thanked us for allowing him to see such a trot! Kerry Ridgway was instrumental in helping me acquire a part ownership of Tzar's sire, Nature's Ballet. Coming from three year's retirement on the Canadian plains, at the age of 14 this extraordinary horse earned his entry into the Endurance Horse Registry of America by successfully completing six 50 mile races and another 100 miler within the short course of four months, beginning one month after I obtained him in 1983. In 1984, I took him on a first for both of us, the Levi Ride and Tie Race. With a big red "STUD" painted on both haunches to warn other competitors not to tie a mare to the same tree with the stallion, Blue impressed all who saw him with his no-nonsense competitive spirit, and his ability to alternately race full out at a gallop or extended trot and then stand quietly resting when tied to a tree waiting for the next rider. From 1982 to 1988, Blue also completed my Tevis Trail Training Seminar, more often than not carrying a student rider on his strong back. The October 1986 Arabian Horse Express featured a 10 page article describing the Seminar. 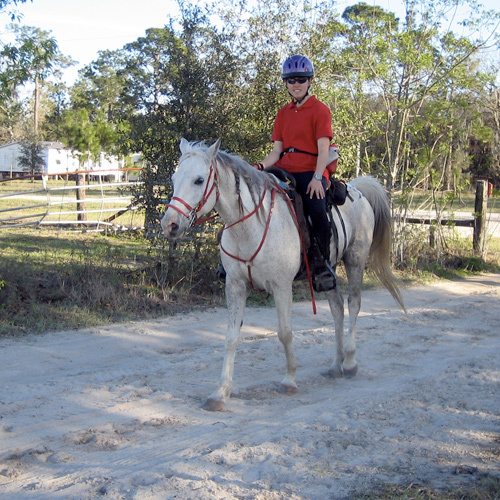 The reporter, a beginning rider who never did learn to post the trot, completed the harrowing 100 miles on Blue, who soon decided to walk all the down hills, and canter all the ups for her, to save both of their backs. Blue carried her in this sensible manner, regardless of what the other horses on the Seminar were doing, ignoring them as they disappeared into the distance on the downs, and calmly passing them in a cloud of dust up the long mountains. It was the experience of a life time for his rider. Blue has filled a unique place in the hearts of our family. His phenomenal disposition and intelligence have been evident as he took my children for trail rides or jumping classes, ponied young horses, packed chain saws into the forest for trail clearing expeditions, carried 6 children at a time on his strong back during vaulting classes, or patiently carried handicapped riders in our adaptive riding program. Exploring new trails, if I needed to know I would get there, I always rode Blue. Spring has graced us with deliciously warm weather -- so unusual at this time of the year. But with 5 ponies now being worked under saddle, I am thrilled for the nice days, even though I feel like I'm in the saddle 24 hours a day! This week has raced by so fast I'll do a quick recap of the last four riding days. Tuesday - 3/11 - I decided to begin my day by walking Drummer down to watch the Piedmont Hounds go off. He was very good, standing quietly while looking wide-eyed at the activity while I talked to neighbors and friends who were there either to enjoy the final weekday hunt of the season riding to the hounds, or watching them from the sidelines. When the hounds finally moved off, Drummer and I walked the 1 mile home, stopping only at one point to watch a beautiful red fox lazily trotting across a field, safe from all concern as it was on the opposite side of the territory from the hounds who were now easily another mile away. The fox popped into a local den, and Drummer and I continued our ride home, enjoying the unusual springtime warmth and sunshine. He is still unshod but we spent our whole time walking on the grass or in the woods. Not so for working Libby -- she wasn't shod as yet, either, but I did want to take her out on part of the gravel road so I opted to throw a set of easyboots on her front feet. Now, Libby has this habit of losing one .. or more.. of her easy boots every time out, so I decided I would stick strictly to the road and not traverse the mucky, oversaturated fields. So... off we go, heading down the road at a merry clip, me trying very, very hard not to listen to the siren song of the spacious grassy fields calling me to come hither and trot across the springy soft ground. I was doing very good not listening to the seductive song as Libby trotted down Willisville Road and back... until we got to Foxlease Farm's back lane at the edge of Cannon Hill's far fields. Libby and I turned down that old road to the stream... and the next thing I knew I was pointing my mare's darling head towards the truck path that led through the fields. The siren song had been too irresistible to ignore! My plan for today was simple -- ride Itchy up the mountain to do the final trail clearing so we can trot non-stop to the top, and get Andy out to see how fit he still is for foxhunting this Wednesday. Of course, I had to wait until the weather warmed up a tad more -- it was in the 30's this morning with a tiny wind -- just enough to make me say "I'll wait until late morning to start". While that meant I was going to be working Andy later in the afternoon, it didn't bother me too much. Getting up the mountain and getting the rest of the fallen trees out of the way was my main priority this morning. As soon as the temperature gauge crept up to 45 -- around 11AM -- that was my signal to go. This time I had packed along my new camera as I wanted to get some shots from the trail going up to the crest of the Blue Ridge. Well, figured I'd better post my ride story from this past weekend before all the details became "fuzzy" like they tend to do nowadays if I don't get the details down soon after the event! Last weekend Anita and I went to the REDLAND EXPRESS endurance ride up at Lake Carl Blackwell in Stillwater Oklahoma. It was about a 5 hour drive but was fun as it was my first "trip" with the new truck and it pulled like a dream and that interior rides like you are in a cadillac! The weather on the drive up was windy but beautiful and the only downfall was we saw LOTS of grassfires in Oklahoma and also the devastation left behind by previous fires. We got started later than I like because Mike had to take the truck to have a gooseneck hitch installed that morning. 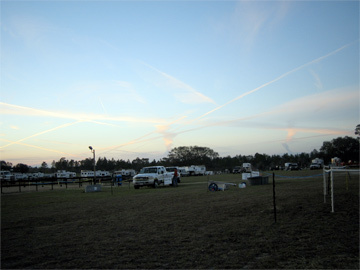 But we still got there around 5 and unloaded our horses and started setting up camp.